Now that I’ve got my doll dress muslin done, I can use the pieces from my own, custom dress and add elements from other patterns, adjusting them to fit, according to my dress muslin. You can see in the photo above, that I’ve taken the pieces from my dress muslin, and traced them to make pattern pieces on paper. 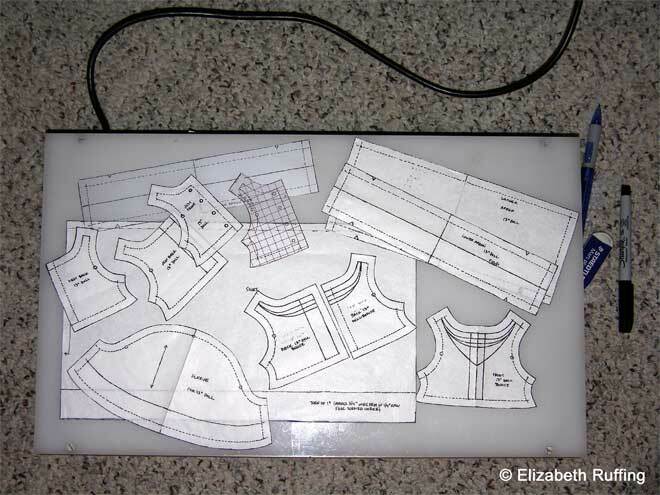 Once I have my own basic pattern pieces in the right sizes and shapes, I can take pattern pieces for additional elements, like sleeves, vests, and aprons, such as those from commercial patterns, and adapt them to fit my own pattern pieces. This is something you can do with clothing patterns for people as well. In this case, I’m using my own bodice and skirt pattern pieces, and I am adding sleeves, a vest, and an apron from an adorable Brown House Doll pattern. Be sure to check out Bev Brown’s designs if you like to sew clothing for dolls. They are super. I adapted my bodice and skirt from doll dresses Max came up with before. Here, I’ve redrafted the BHD pieces to fit my dress. I do this by tracing the elements I want to adapt, and laying the tracings over my pattern pieces. Then I can redraw the lines to fit my pattern pieces. The top of the sleeve needed to be redrawn to fit the armhole of my pattern. The vest had to be completely redrawn according to the lines I marked on my bodice for my neckline, armholes, and waistline. The apron should work as it is, but I will be adding a row of machine-embroidered fabric on the lower edge, which means I may need to widen the sides of the apron to compensate for the amount I will need to turn under on the raw edges. Making another muslin at this point is not a bad idea, but, instead I will leave my seam allowances a little wide, in case I need to adjust them. I made some changes to my bodice that I haven’t retested. Next comes fabric selection.